A reoccurring concern from students is the volume of unwanted emails in their University inbox which makes it harder for them to notice important messages. Busy email inboxes is a fact of life for everyone and we all make use of Outlook ‘rules’ to manage incoming messages. This article describes how Moodle forums send email messages, and shows how to alter forum subscriptions to help students proactively manage their incoming messages. Student instructions managing their Moodle emails and for creating rules are available in this Ask Napier article. How do I send urgent messages to students in Moodle? 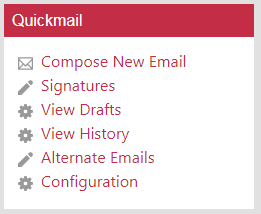 For urgent messages use Moodle’s QuickMail block which will immediately send the message to their Outlook account. It is strongly advised to also post the message to the Announcements forum so there is a record of the message available for all students. Can I use forums to send urgent messages? This is not recommended because, by default, students receive forum messages as a daily digest in the evening. The digest is a single email containing all forum messages, which prevents students from receiving too many emails. However students can opt out of the digest to receive single emails immediately. Please note that the ‘Mail now’ option will only reach students who have opted out of the digest. How to students opt out of the email digest? 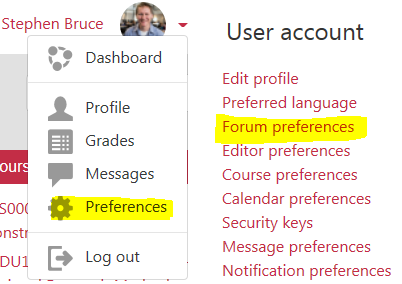 From their Moodle dashboard they should click on their name and select ‘Preferences’. In the next page they click ‘Forum preferences’. From the email digest type drop-menu select ‘No digest (single email per forum post)’. Student instructions are available in this Ask Napier article. How can students choose which forums to receive emails? 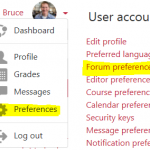 Forum subscriptions control whether students are notified by email when new messages are posted. 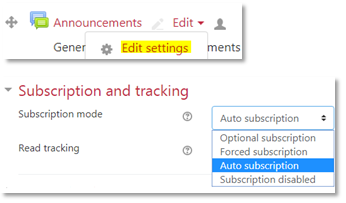 The subscription type can be changed in the forum settings. Forced means students cannot unsubscribe and will always receive notifications. This is the default setting for the Announcements forum in every module, and can be changed by staff. Optional means they are unsubscribed initially but can subscribe. This is the default for new forums. Auto means students are initially subscribed but can unsubscribe if they wish. 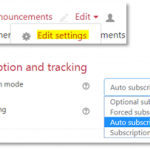 Consider using the Auto subscription setting to allow students to opt out of non-essential forums and to manage their email notifications. Students can unsubscribe from a forum by clicking the cog icon. Student instructions are available in this Ask Napier article. How can students manage their Office 365 email inboxes? Students can set up rules to automatically perform specific actions on messages as they arrive. This can be very helpful for managing Office 365 inboxes and is a skill that transfers to the work place. For instance students may wish to create folders and create a rule that automatically moves messages from Moodle there. Or they may wish create a rule that forwards certain email messages to a personal email address. 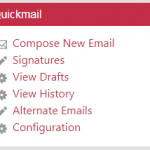 Student guidelines for creating and using rules in Outlook can be found in this Ask Napier article.